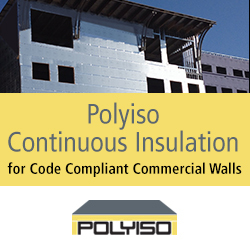 Polyiso is a closed-cell, rigid foam board insulation used in roof and wall assemblies within commercial and residential buildings of all types. Because of its high thermal performance, it is the product of choice for energy-aware architects, specifiers, builders, building owners, contractors and consumers. National model energy codes emphasize the use of continuous insulation systems, which provide a continuous insulation layer over an entire wall, not just in the wall cavities.